lower center at right of scroll: L Boilly. Possibly (anonymous sale [Prince Galitzin? ], Paris, 18 December 1826, no. 140). André Vincent, Paris, by 1930; (his sale, Galerie Jean Charpentier, Paris, 25 May 1933, no. 15); purchased by (Étienne Bignou, Paris, France); sold 1933 to Chester Dale [1883-1962], New York; bequest 1943 to NGA. Lent by Vincent to an exhibition in Paris in 1930. The catalogue of the Vincent sale both confuses the provenance of this picture with that of its composition's other version, then in the collection of Baron Henri de Rothschild, and misidentifies it as The Young Artist, a painting actually at the Hermitage, Saint Petersburg. The Henri de Rothschild collection was evacuated to England during World War II, where a German bombing raid destroyed many of its pictures, including, it is believed, the "Rothschild version" of the NGA painting. The Art of Louis-Léopold Boilly: Modern Life in Napoleonic France, Kimbell Art Museum, Fort Worth; National Gallery of Art, Washington, D.C., 1995-1996, pl. 151, 177, repro. (shown only in Washington in 1996, no. 19). Marmottan, Paul. Le Peintre Louis Boilly. Paris, 1913: 95-96. French Paintings from the Chester Dale Collection. National Gallery of Art, Washington, 1942: 18, repro. Washington Times-Herald (18 July 1943): C-10. French Paintings from the Chester Dale Collection. National Gallery of Art, Washington, 1944: 18, repro. French Paintings from the Chester Dale Collection. National Gallery of Art, Washington, 1953: 22, repro. Benisovitch, Michel N. "Une Autobiographie du peintre Louis Boilly," in Essays in Honor of Hans Tietze. Paris, 1958: 370, repro. 369. 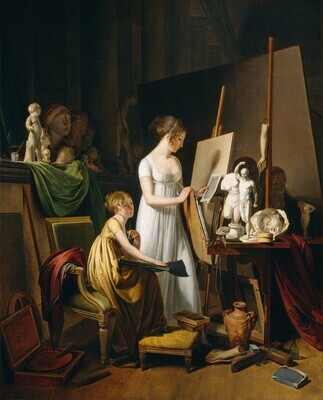 Eighteenth and Nineteenth Century Paintings & Sculpture of the French School in the Chester Dale Collection, National Gallery of Art, Washington, 1965: 23, repro. European Paintings and Sculpture, Illustrations. National Gallery of Art, Washington, 1968: 9, repro. Wilenski, R.H. French Painting. New York, 1973: 155. European Paintings: An Illustrated Summary Catalogue. National Gallery of Art, Washington, 1975: 32, repro. French Painting 1774-1830: The Age of Revolution. Exh. Cat. Metropolitan Museum of Art, New York, 1975: 321. Einstein, L. "Looking at Eighteenth Century Pictures in Washington." Gazette des Beaux-Arts, series 6, vol. 47, no. 1048-1049 (May-June 1956): 244. European Paintings: An Illustrated Catalogue. National Gallery of Art, Washington, 1985: 50, repro. Siegfried, Susan L. The Art of Louis-Léopold Boilly: Modern Life in Napoleonic France. Exh. cat. Kimbell Art Museum, Fort Worth; National Gallery of Art, Washington, D.C., 1995-1996: no. 19, repro. Eitner, Lorenz. French Paintings of the Nineteenth Century, Part I: Before Impressionism. The Collections of the National Gallery of Art Systematic Catalogue. Washington, D.C., 2000: 4-13, color repro. Hand, John Oliver. National Gallery of Art: Master Paintings from the Collection. Washington and New York, 2004: 352, no. 284, color repro.